Cost to remove poison ivy varies greatly by region (and even by zip code). Get free estimates from landscapers in your city. Cost to remove poison ivy varies greatly by region (and even by zip code). The average cost to remove poison ivy is $500. Where can we find poison ivy? How much does it cost to remove poison ivy? Poison ivy is one plant you want to stay away from. Coming in contact with poison ivy can result in anything from a slight itch to severe blistering that can send you to the hospital. It is never a good idea to allow poison ivy to grow anywhere where people or pets may come in contact with it. The trouble is, it can be difficult to eradicate, and usually requires a professional poison ivy specialist to come in to decide which removal method to use. When hiring an expert, you will want to budget, on average, about $500 for spraying the plants, pulling the surface plants from the soil around one tree or approximately 10 square feet of surface area, and properly disposing of the plant debris. When it comes to identifying poison ivy, most people simply look for clusters of three shiny leaves found growing on a vine-like stem. While this is a common way to identify some forms of the plant, it is important that you understand the different stages of poison ivy in order to avoid coming in contact with it when it looks different than you expect. Usually growing in clusters of three leaflets (with the middle stem slightly longer than the other two), poison ivy doesn’t always grow in a vine. It can also resemble a shrub or even ground cover. 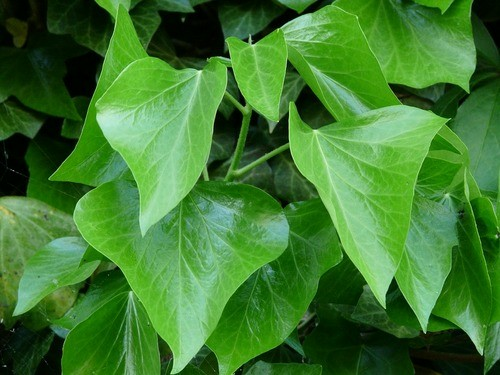 Its leaves too, can look somewhat different depending on the season and the region in which it is growing. Some poison ivy plants feature elongated or lobed leaves with either jagged or smoothed edges (but never serrated). Its color too, changes with the seasons. While it is usually green in the summer, the plant can appear more reddish, orange and yellow during the fall and winter months. To make matters worse, poison ivy plants tend to change color and shape depending on the region and season in which they are growing. Compound leaves that are made up of three leaflets that feature along middle stem and two smaller leaflets located directly opposite one another. Poison ivy can be more than just a nuisance, it can be dangerous. With more than 85% of the general population allergic to it, and about 15% experiencing dangerous reactions like swelling, fever, difficulty breathing, or infection that send them for medical care, poison ivy should always be taken seriously when discovered in your yard or garden. Most people know full well about the rash a poison ivy plant can cause, but few understand how or why their skin reacts. Dermatitis (swelling and itching of the skin) is caused when the skin comes in contact with the urushiol (oily sap) found in the plant. Since the human body considers urushiol to be dangerous, it reacts by increasing the histamine reaction in the body, sending fighter cells to fend off harm. This causes swelling, itching, and redness of the area. While the rash itself is not harmful, when scratched repeatedly, it does open the skin to infection. Two extremely dangerous forms of poison ivy exposure are when the plant is eaten, or the affected person comes in contact with smoke filled with urushiol. Burning poison ivy can be dangerous if anyone breathes in the smoke. Once the urushiol-filled smoke enters the nasal passages and throat, the airway may begin to swell, making it impossible to breathe. An allergic reaction in the digestive tract can also cause serious harm by prohibiting food intake, causing dehydration from vomiting, and even disrupting important digestive processes. Touching a poison ivy plant, or breathing in smoke from a burning plant aren’t the only things that may cause your body to react. Some people even have secondary reactions when they come in contact with the oils due to another source. A main culprit may be your pet. While dogs do not usually react to poison ivy, if they have schlepped through an area where it is growing, the oils could get stuck in their fur and later be transported to the owner’s skin. Since poison ivy oils can live for up to five years (even when off of a live plant), coming into contact with it from pets is common. One of the best ways to eradicate oils from an animal is to either hose it down carefully with water (making sure to wear protective clothing since the oils will be in the water), or to have your dog professionally washed by a groomer. Remember, too, that the entire plant contains urushiol, not just the leaves. Touching its stem and roots can also cause a reaction. To make matters worse, allergy-inducing properties can remain on dead plants, too, so even if the poison ivy you discover looks dead that does not mean it is safe to touch. Edging: be careful when trimming the edges of your property, since poison ivy plants sometimes grow in places where the grass stops. Shrubs: sometimes looking a bit bushy, poison ivy commonly grows along the base of other shrubs. There are three main ways to get rid of poison ivy in your yard: killing the plants with herbicide sprays; pulling it out of the ground by hand; or a combination of the two. To find out which approach is best for you, check out the pros and cons of each below. While the easiest and fastest way to get rid of poison ivy, using chemical herbicides only works temporarily. Chemicals only kill surface plants, leaving the roots untouched and able to regrow. Costing on average about $300 for professional application, be warned that if you want the professional to also pull out and dispose of the dead plants after spraying, you will be charged an additional $50 per hour for the added labor and about $25 per 10 lb. bag of refuse. One of the major drawbacks of using herbicides to kill off poison ivy is its high environmental impact. Chemical eradication impacts the environment the most, leaching into the surrounding soil and becoming dangerous to other plants, pets, and people that come into contact with it. Considered the gold standard when it comes to getting rid of poison ivy, manual eradication is the most effective. By hand digging every plant and root from the ground, the plant seldom returns. It is backbreaking work, however, and takes more time. This is why it is the most expensive removal method, costing about $700 for a single tree or small area. The impact on the environment is minimal, however, since no herbicides are used. More work than simply spraying the plant, but less than manually removing every plant and root from the ground, the combination approach offers the benefits of both. Costing on average about $500 for one small area (about 10 square feet or a single tree), the combination approach is effective in most cases and offers less of an impact on the environment than strictly spraying the pants. However, since some chemicals are used to kill the poison ivy first, it does come with some downsides. Removing poison ivy properly takes a certain amount of skill and knowledge. Taking on the job yourself could result in a bad reaction – and even the return of the plants. Hiring a professional who understands how the plants grow and how to safely remove them from your property will result in the most trouble-free eradication. However, not every landscaper is qualified to remove poison ivy. Be sure to inquire whether the crew you want to hire has been specifically trained in dealing with poison ivy. This includes knowing how to best remove and dispose of the plants. Depending on the amount of poison ivy that needs to be removed from the area, the cost can run between $300 and $700, with the average hourly rate running $50-$75 per hour for tackling larger areas of ground ivy. If only one tree or small area is affected, the cost will run about $500. This will include manually digging out the vines and roots. Most jobs take less than three hours. Keep in mind though, if the vine has grown far enough up the tree to require the specialist to use a ladder, the cost will rise to about $100 per hour just for cutting out the vine. An additional cost of about $25 per 10 lb. bag of refuse will be levied to dispose of the plant. Travel fees ranging from $25-$40 per hour is also common. Permits and licenses. In most cases, no special permits or licenses are required for poison ivy removal. The one exception may be if the vine has climbed upward on a tree, requiring longer ladders or even tree removal. DIY options. Removing poison ivy yourself may seem like an easy job, but it must be done properly to ensure that the plant and its roots have been completely eradicated – and without any negative reactions for the person doing the work. If you want to avoid a glyphosate-based product, you may want to try putting together your own plant-killing spray: mix up a gallon of vinegar with 2½ cups of salt and ¼ cup of dish soap. Use your special brew on the leaves and vines. You might need to do a couple of applications, especially for older, more resilient plants. You should also know that, like the commercial stuff, your vinegar-based weed-killer will kill *all* the plant life it comes in contact with, so be careful where you spray it. Guarantees. While every removal specialist is different, it is common for them to offer a guarantee for their work. Most guarantees run for 3-6 months and are included in the base price of poison ivy removal. That way, if the plant re-emerges in the same area, you are protected since they will come back out and get rid of it for free. Herbicide use. You may think that using a herbicide to try and kill poison ivy plants before a professional comes to completely take it out is helpful, but it can sometimes make the professional’s job harder. Refrain from spraying any chemicals on the plants beforehand, unless otherwise instructed by the removal specialist. Prioritize the process. When poison ivy seems to be taking over your property, it can be difficult to know where to begin taking it out. Take a tour through your yard, keeping a list of areas where the plant is posted. Then prioritize the areas where your removal specialist should begin. Depending on the size of the root structure, it may not be necessary to remove each plant individually, but rather take out the entire underground root system. Your professional removal crew will be able to help you decide what areas to tackle first. Go for the roots. Pulling poison ivy plants out of the ground is only the first step to getting rid of it for good. In order to completely eradicate the plant from a specific area, you must dig the roots out of the ground. Otherwise, the plant will re-sprout. This is another reason why you should never bury the plants with topsoil to get rid of them – unless you kill the plant’s roots, it will always re-emerge. Never burn poison ivy. Warning: Burning poison ivy plants (even dead ones) can be deadly! The oils that cause the allergic reaction in most people mixes with the smoke, and when inhaled can cause swelling and blistering in the nose, throat, and even lungs. Don’t plant edibles where poison ivy has been. The oils that cause poison ivy to be a problem for most people can linger in the soil for months, so be careful not to plant fruits, vegetables, or herbs in the area for at least 12 months. Getting rid of poison oak and poison sumac. Poison ivy isn’t the only dangerous plant that could be overtaking your garden or yard. Call for professional help is you discover sumac or poison oak, too. Both can cause serious allergic reactions and need to be removed by a trained professional. How do you get rid of poison ivy in your yard? There are several methods that can be used to free your property from the dangers of a poison ivy outbreak. While it is possible to eradicate the plant with chemicals and sprays, the best method for removal involves manually digging out the plant’s root system and removing the dead plants from the area. What is the best way to get rid of poison ivy? The absolute best way to get rid of poison ivy is to pull out the plants and then dig up the roots. How do I get rid of poison ivy fast? The fastest way to get rid of poison ivy is to spray it with an herbicide or homemade spray using vinegar, salt, and dish soap, followed by pulling and disposing of the dead plants. Can you pull out poison ivy? Yes, but be prepared to deal with it again. Pulling the plant from the ground leaves behind the roots, which enable it to re-grow. Does bleach kill poison ivy? Bleach kills just about any plant. However, vinegar solutions are recommended for weed killing without using harsh chemicals. Also, you should never mix bleach with other chemicals due to the potential for noxious gases to be produced and you shouldn’t put bleach on a poison ivy rash. Not every landscaper is qualified to remove poison ivy. Be sure to hire only those professionals who have been trained in removing it. Does poison ivy die in winter? The plants you see above ground do indeed die off in the wintertime, but the roots do not and the plants can leave behind oils in the soil which can cause an allergic reaction, even in colder months. How much does it cost to remove poison ivy in my city? Cost to remove poison ivy varies greatly by region (and even by zip code). To get free estimates from local contractors, please indicate yours.